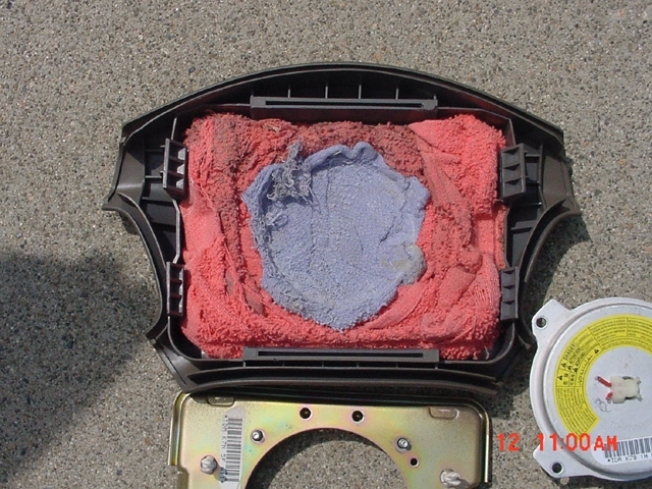 An actual airbag in the used car of a California woman who drove the vehicle for two years before discovering that her driver side airbag was filled with mechanic rags. There is growing concern over airbag safety in used vehicles, and new warnings for motorists who might fall victim to unscrupulous auto repair shops that fail to replace used or damaged airbags. According to a Consumer Affairs report, in 2004 one out of every 25 previously damaged vehicles had phony or dummy airbags, but only a handful of states have laws regulating airbag system replacements. An airbag is part of a vehicle's safety restraint system, a flexible envelope designed for rapid inflation in an automobile collision, to prevent occupants from striking hard items like the windshield or steering wheel. According to an official at the NYPD auto crimes division, there are an estimated 75,000 air bags are stolen out of cars every year. Most of these are resold to body shops over the Internet, fetching between $2,500 and $3,000. Airbag tampering can include stuffing the compartments with beer cans, rags, paper or packing peanuts. Sometimes the original, faulty airbag is just pushed back in. And sometimes the air bag isn't replaced at all, leaving the compartment empty, Consumeraffairs.com reported. Industry experts recommend taking your used vehicle, or any car you might buy, to a trusted mechanic to check out its safety components, including the airbag. The NYPD and insurance companies are urging consumers to take extra precautions. For more information visit Carfax where your can check your VIN for crash history, or get more tips at insurancefraud.org.